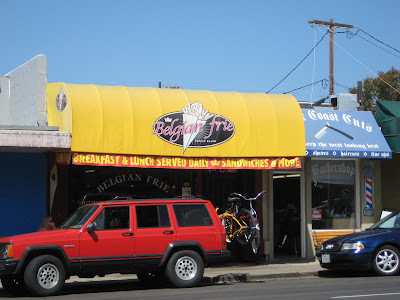 We made several fun food stops this past Saturday, beginning with Belgian Frie in Pacific Beach. It's a fun little place where we picked up fries and waffles for breakfast... isn't that great? 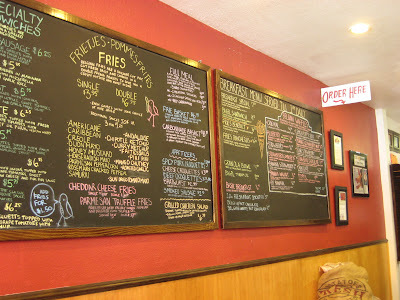 The menu's composed largely of fries and waffles. I admit to being a fan of the chalkboard menus. When they're done well, they look great. 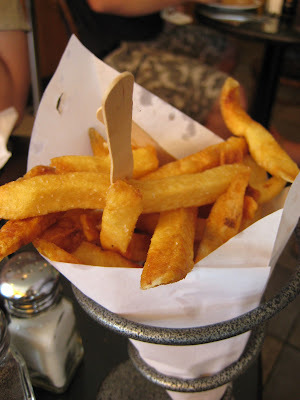 The fries are served a variety of ways or plain with a variety of sauces. D. and D.B. 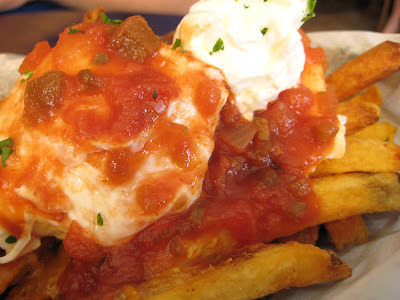 had the fries rancheros, topped with poached eggs, salsa, cheese, and sour cream. D.D. and I ordered the lemon poppy seed waffle. Since Belgian waffle batter is yeast-leavened, it can be cakey and not at all crisp. However, this waffle was gorgeous and fluffy with a nice crust. 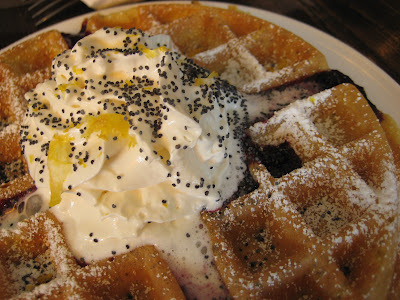 It was topped with a great blueberry compote, lemon zest, whipped cream, and poppy seeds. The batter could have used more lemon flavor, but it was very good. Of course, we ordered a lovely cone of fries with three dipping sauces, garlic mayo, curry ketchup, and honey mustard. The dipping sauces were fantastic and the fries were double-fried, making them nice and crispy. Afterwards, we made a pit-stop at the cook's playground of Great News. One of these days, I'm going to post about Great News, but this post is already extensive enough without it. 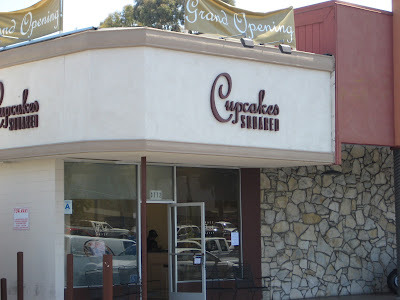 D.D., a Point Loma native, mentioned that he had heard about Cupcakes Squared and wanted to try it. Of course, I would never oppose a mission to satisfy one's sweet tooth. Upon entering, we were offered samples of the Lilikoi, a vanilla cupcake with passionfruit frosting. The frosting was excellent and tangy with passionfruit. However, the cupcake didn't impress, because it was greasy. It squished with a little bit of oil when I bit into it. Oy. It was somewhat of an awkward moment, because we were surprised by the sample being... well, not that great. We were also taken aback by the prices. The square cupcakes, while cute, weren't very large. They were about a 2-inch cube, but were selling for $2.75 to $3.50 apiece. While I understand that quality ingredients were used, it's still a bit much, considering our impressions of the sample. D. ordered the Chocolate^2 and the S'mores (left and top, respectively), while I ordered the Lemon and "Red" Velvet (bottom and right, respectively). The "Red" Velvet intrigued me, because Cupcakes Squared doesn't use food coloring. I could definitely live without dyeing my innards red, but I can't live with bland. 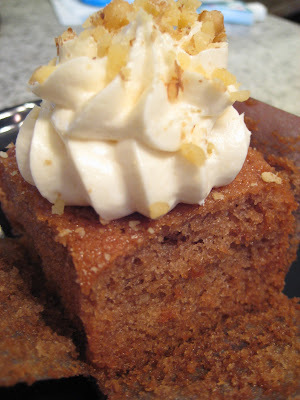 While red velvet is typically mild, this was a plain buttermilk cake with very little flavor. Texture was ok, but on the dry side. Once again, the frosting was fabulous. D.D. felt it should have been denser, since it was cream cheese, but it was delicious. 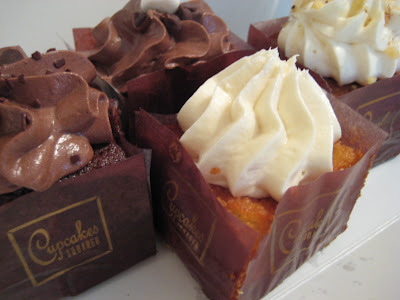 The unifying theme of this visit was that Cupcakes Squared makes killer frostings. While I love frosting, I don't think that anything can stand on frosting alone. Nope, not even cupcakes and their almost 1:1 ratio of cake to frosting. We all felt that the establishment had potential, but needs to work out kinks in their craftsmanship and consistency. I bring up consistency because my lemon cupcake was the winner. The cupcake had the warm eggy flavor of a pound cake, the lightness of a chiffon cake, and plenty of lemon. Although the frosting was supposed to be lemon, I was happy that it turned out to be a light and wonderful vanilla buttercream. I'm not sure if that was intentional, but whatever... I don't argue with good things. D.B. and D. were pretty much done with the sweets, but D.D. and I were chatting about The Elegant Truffle, which had received raves on Chowhound. Hey, we were already in the neighborhood. The friendly staff hands out samples galore. I stepped out to take a phone call and apparently missed, as D.B. calls it, "a truffle buffet". Egads! When I returned, I was able to sample a dark chocolate brownie, which tasted fabulous, but was really dry. I couldn't resist the dark chocolate cheesecake and D. bought a dark chocolate-dipped banana. Yeah, it was that good. For those who like creamy cheesecakes, this isn't for you. 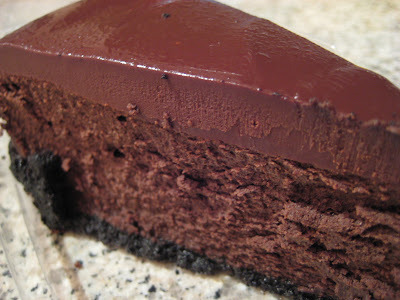 This was a slice of dense, rich, fudgy heaven. The chocolate was explosive... bitter, dark, and sweet all at once. I'm sure it's sitting in my aorta right now, but I have no regrets. We returned home to do some gardening and hang out with Bear. For dinner, we met up with M., C., and M. at Pizza Port in Solana Beach. It was packed. Obscenely so. People were practically shanking each other for tables. If it weren't for eagle-eyed C., we would have ended up eating on the sidewalk. 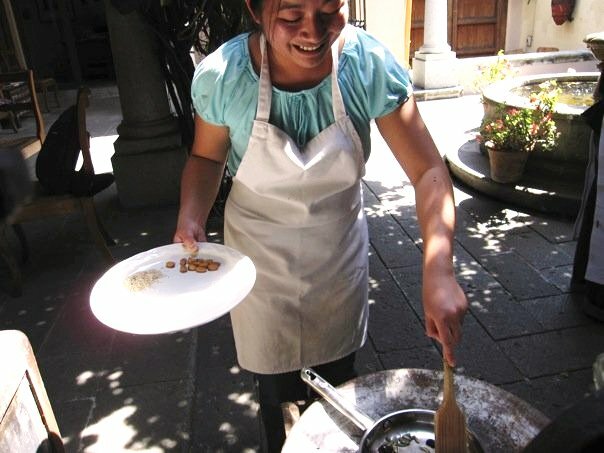 Once we sat down, we had the opportunity to enjoy their delicious creations. D. and I love the Carlsbad, a pesto/feta pizza with artichoke hearts and chicken. There was also the Monterey, with more artichoke heart goodness buried under a classic tomato/mozzarella topping. Yum. I love a weekend of eating well. OK...how have I never been to ANY of these places? I've been meaning to hit up the cupcake place. Too bad it sounds only so-so and I'm not a huge frosting person. The waffle/fries place is on my list for this weekend. Thanks for the great post! What a wonderful report! Thanks for sharing! I remember people talking about Cupcakes Squared at the blogger mixer. Is that what inspired you to go? You guys sure know how to eat! Hmmm. Interesting breakfast you had there. Fries and waffles? Hmmm. I used to live quite close to that cupcake shop. Maybe they are desperately trying to keep those cakes moist and adding too much oil in their batter??? That seems strange that they were so greasy. Hopefully they'll get it together. Sounds yummy anyway. 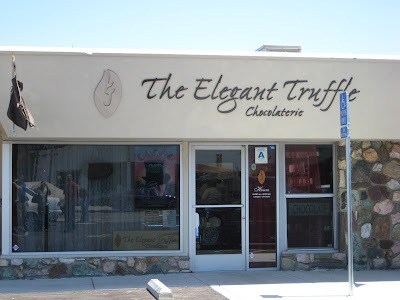 So does the truffle place you mentioned! Pizza Port rocks. My friend's bro is the brewmaster there. Often find that the smaller, family type run and owned eateries just have the best food ever! Enjoyed your post...it's always fun to learn about different places and their goodies. Those chocolate items look so scrumptious! hey! i found you through pinch my salt's site!! it's so fun to see some other san diego bloggers! I've enjoyed looking through your site! Wow Marie, that sounds like quite a day! :-) I am planning to check out Cupcakes Squared sometime soon, but I have a feeling Will's cupcakes at Eclipse will be a tough act to follow. The waffles at the Belgian place also look very interesting!